The Oklahoma Constitution and U.S. Supreme Court decisions ban debtors prisons, but Oklahoma is among the states cited as maintaining such archaic institutions. The Tulsa County jail is growing dangerously overcrowded. The facility has exceeded its official capacity for the past eight months. According to a report this month in the Tulsa World, the jail’s population could soon exceed official capacity by nearly 20 percent: 300 more than the 1,700 inmates the jail is designed to hold. What is the reason for overcrowding? In large part, a sheriff’s official said, it’s because of people being jailed for failure to pay fines. The financial meltdown that resulted in record unemployment left people vulnerable to being jailed for failure to pay various public and private debts. Tulsa jail has become an Oklahoma debtors prison. Overcrowded jails present myriad problems for inmates and for the public. Simply housing an inmate costs taxpayers around $50 a day. The Tulsa World reported in November that 6,400 inmates had been booked in the past two years for failure to pay fines – a 12 percent increase since 2009. If each was held only one day, that’s $350,000 in debtors prison costs. If each indebted inmate spent just three days in jail, that’s a million dollars spent on a Tulsa debtors prison in the past two years. The housing costs may be just the tip of an iceberg. Overcrowding poses safety and health risks for inmates and jailers. Risk to inmates means financial risk for taxpayers. The Oklahoma Supreme Court earlier this year ruled that Oklahoma inmates can sue for civil rights violations resulting from cruel or usual punishment in jail. Health and safety risks associated with overcrowding leave the county vulnerable to individual or class-action lawsuits that could potentially cost taxpayers millions of dollars. What’s more, the basic reasons indebted inmates are jailed can be called into question. The United States outlawed debtors prisons in 1833. The Oklahoma Constitution’s Bill of Rights banned debtors prisons 105 years ago when we first joined the United States. Yet Wikipedia’s less-than-complete list includes Oklahoma among 17 states that currently allow debtors prisons. The Wall Street Journal has reported that one in three states still have debtors prisons – an archaic form of justice many believe was outlawed shortly after the end of slavery. What’s up with that? There are several ways a person can be imprisoned for debt in the United States. Not all of those are included among the increasing number jailed for failure to pay fines as reported in Tulsa World last year. In each case, the court distinguished between willful failure to pay and the inability to pay. Going broke simply cannot be the reason a court sends someone to jail – in those three circumstances. The difficulty for people jailed contrary to the court’s ruling is that many can’t afford proper representation by a criminal defense attorney. And we can presume that overcrowding of jails with indigent defendants likely means the public defenders appointed to represent them are also overworked. The use of debtors prisons to squeeze proverbial blood from a rock goes beyond criminal matters. The Wall Street Journal reported that imprisonment of U.S. citizens who run afoul of debt collectors is on the rise. In these cases, people aren’t jailed directly for failure to pay. Instead, they are jailed for failing to appear when a creditor sues them, showing contempt of court in connection with a creditor’s lawsuit, or failure to pay fines arising from a legal matter related to consumer credit. Does that happen in Oklahoma? You can bet your bottom dollar it does. The WSJ reported that in 2010 in McIntosh County, near Muskogee and south of Tulsa, a court issued 1,500 debt related warrants – nearly double the 800 a year issued before the financial crisis of recent years. In our downtown office, across the hall from the District Attorney’s “bogus check” office, we daily see throngs of indebted Tulsan’s struggling to come clean on financial matters in hopes of avoiding jail or prison. Some may have been careless or deliberate, but others found themselves unable to pay because the economy left them unable to pay debts they fully intended to pay. According to Wikipedia, there’s yet another group of residents who may find themselves in an Oklahoma debtors prison: those who were unable to pay court ordered child support. Oklahoma family law provides a means to modify child support amounts when a parent’s circumstances change for the worse. Not all parents know how to seek a modification. Those who are unable to keep up with child support payments may also think they can’t afford an attorney to help with a modification. 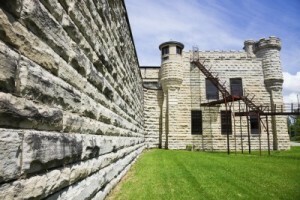 In the current environment, it’s extremely likely that people are sitting in Tulsa jail because – as the 1971 court said – there are “old infirmities” that “absence of challenge has allowed to stand.” At Wirth Law Office, we know many people are reluctant to call an attorney because they’ve been told they don’t have a case, or that there’s nothing an attorney can do. They may be wrong. It might cost you nothing to find out. As you’ve read in this article, there are constitutional bars against throwing people in jail for being unable to pay fines. A Tulsa attorney may be able to quickly determine the likelihood that you or a family member has been jailed for unconstitutional reasons. It costs nothing to call us at Wirth Law Office to find out. If debt collectors are filing court cases you can’t keep up with, or not properly serving you notice of court dates, we may be able to help. Sometimes a bankruptcy filing can stop debt collectors in their tracks. It may be better to spend your scant resources on a proper bankruptcy filing than to continue to do business with collectors who can get you thrown in jail for not playing their game, their way. Our Tulsa bankruptcy attorneys can advise you on preferred options. And if you can’t pay child support, getting thrown in jail for being unable to pay will do nothing to make you a better parent. Our Tulsa child support attorneys can advise you if you have a case for a child support modification – or if you may be owed child support that can help you get out from under debts that could get you thrown in jail. If you think you can’t afford an attorney and you were jailed because you can’t pay court costs, fines, consumer debt or child support, chances are you shouldn’t have been in jail in the first place. Before you go back to court where you may agree to terms you can’t meet just to stay out of jail, call our office for a free consultation about your case. Your meager resources – or whatever help family or friends might offer – may be better spent on proper legal representation. There may be more to your case than you’ve been told. For a no-cost, no-risk, no-obligation consultation to find out if you’ve been illegally jailed for failure to pay debts, call the Wirth Law Office at (918) 879-1681 (or toll free at (888) Wirth-Law) or submit the question form at the top right of this page.